need to make sense of a topic....to thetopic.Writing Mattersemphasizes the writer's responsibility to explore a topic thoroughly and creatively, to assess sources carefully, and to provide reliable information at a depth that does the topic justice....tothemselves.Writing Mattersencourages writers to take their writing seriously and to approach writing tasks as an opportunity to learn about a topic and to expand their scope as writers. Students are more likely to learn about a topic and to expand their scope as writers. 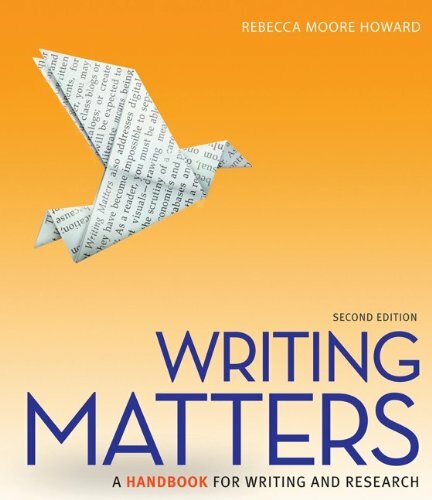 Students are more likely to write well when they think of themselves as writers rather than as error-makers. By explaining rules in the context of responsibility,Writing Mattersaddresses composition students respectfully as mature and capable fellow participants in the research and writing process. Rebecca Moore Howard is the coeditor of the Boyton/Cook title Pluralizing Plagiarism (2008). She is Associate Professor of writing and rhetoric at Syracuse University, where she teaches courses in composition pedagogy, authorship theory, writing program administration, composition history, and stylistics. She is the author of Standing in the Shadow of Giants: Plagiarists, Authors, Collaborators.